billarnold.typepad.com: Did Someone Say Twins? About a month ago Valerie and I talked about the idea of giving artificial insemination a shot. We knew that this would be covered by my new health insurance, so we thought it was worth a try and scheduled an appointment with a nearby fertility clinic. The doctor we met with told us that our chances were very slim and asked if we had considered in vitro fertilization. We said that we had discussed it years ago but were uncomfortable with the process. We discussed our concerns and the doctor informed us that his institute would be willing to come up with a plan that we would be comfortable with. We also discovered that in vitro, which is a fairly expensive procedure, would also be covered by my insurance. 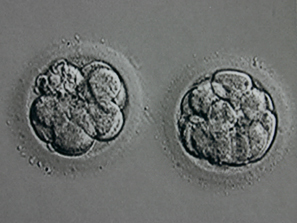 During a normal in vitro cycle, excess embryos are frozen for future use. I'm not sure how I personally feel about this process. It appears to be relatively safe these days. The ethical dilemma for me, however, lies in the fact that fertility specialists will only freeze those embryos that meet a certain criteria. This means that any "extra" embryos would be discarded (or possibly donated to science). Because Valerie and I were not comfortable with this prospect we decided to have only two eggs fertilized. That way we knew we could use all existing embryos no matter what. Even if they did not meet the criteria for freezing, they could still be transferred and therefore given a chance for survival. Our doctors would have preferred for us to fertilize 4-6 eggs. Remember, you can't be sure how many will actually become fertilized, so statistically speaking, fertilizing 2 is not the "safest" route to follow. A nurse told us that in her 6 years at the institute, no one had ever made this kind of request. Fast forward to last Sunday...Valerie was given an anesthetic and her doctors retrieved 3 healthy eggs. I was given an anesthetic and my doctor retrieved plenty of sperm. We were sent home after three hours or so and told to wait for a phone call. On Monday morning we received word that we had two fertilized eggs (zygotes)! Next, we had to wait till Wednesday to have the new embryos transferred to Valerie's uterus. I watched the sonogram as the doctor pushed our microscopic babies into Valerie on a tiny air bubble. What now? We wait and pray until the 16th, when Valerie will be given a pregnancy test at the clinic. Any kind of a home pregnancy test would probably result in a false positive because of the progesterone I have to inject into Valerie's body every night. Please pray that the embryos attach themselves safely to Valerie's uterus. You can read more about this process here. Also, pray that they will continue to grow into full-term, healthy babies! WOW!!!!!!!!!! !That is fantastic! You absolutely will have our prayers. Good luck staying calm until the 16th! Thanks! We are hoping and praying! We will definitely be praying for you guys and the two little lives! We love you!! You know we're praying!!! Stick, babies, STICK!! :) Much love to all 5 of you! !